The clay for this large and graceful stoneware vase was raised by hand before welding it to its base. (Slabs this large are not generally raised in this particular manner as they are unwieldy and tend to break and fall rather easily.) 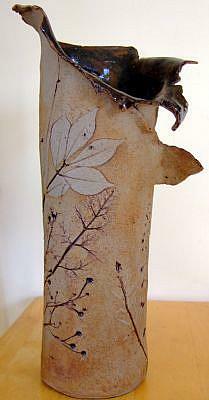 Gathered twigs and foliage were pressed into the clay prior to firing. 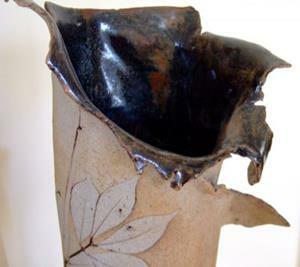 Before the second firing, the entire piece was dipped in glaze and the glaze on the outside was rubbed off, leaving the remaining glaze on the inside and in the incised areas on the outside. The piece was fashioned in Autumn and the natural materials were gathered from the earth . 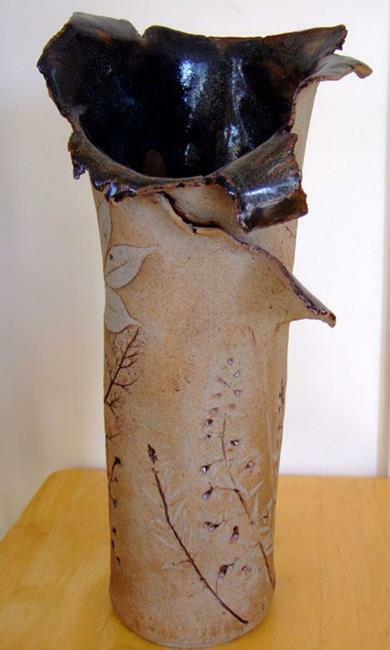 If you run your hands up and down the sides, you can still feel where my hands lifted the clay, making this piece a very personal statement from within. Please click on the magnifying glass to see a much more detailed view.